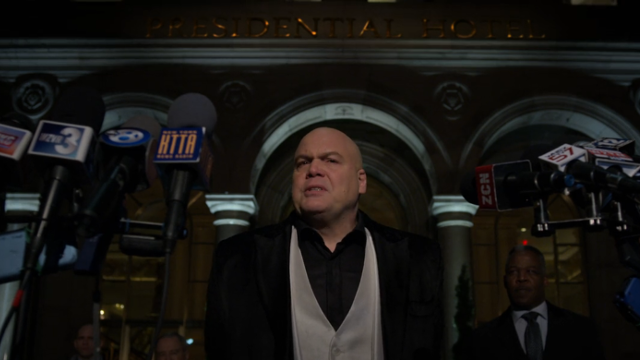 Daredevil season 3 episode 11 sees Fisk a free man. A judge overturns Fisk’s conviction, freeing him from FBI custody. With his freedom officially restored, Fisk tracks down the current owner of his missing painting. The owner explains how the painting was stolen from her family by the Nazis during World War II, and that it wasn’t Vanessa’s to give to Fisk. Fisk tells the woman that Vanessa would have wanted her to keep the painting, and that’s all that matters to him. 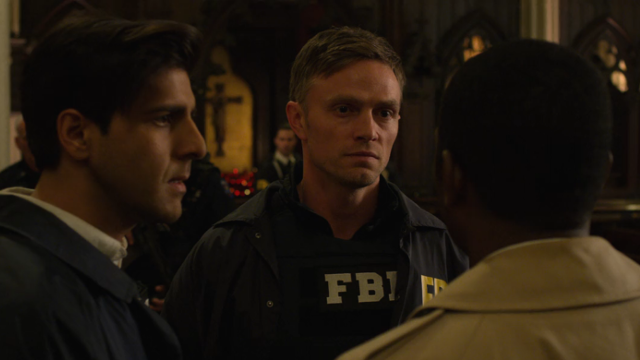 After their showdown with Dex in the previous episode, Karen and Matt hide in the church while Dex, Ray, and the FBI square off with the NYPD over the crime scene. While hiding, Matt tells Karen that he gave up his one chance to kill Fisk in order to save her. Karen tells Matt that she killed her brother in the accident and that she murdered Wesley. She tells Matt that killing someone changes who you are and how you view yourself. Maggie does her best to hide Matt and Karen. Karen notices how Matt has put up a wall between himself and his mother. Karen tells Matt that is and always has been his problem. He pushes the people away who care about him. Matt says he’s treated Karen and Foggy poorly to keep from hurting them. Karen says he’s acted this way to keep from hurting himself. Dex begins to have a psychotic episode over his frustration at losing Matt and Karen. Dex orders Ray to take over the crime scene from the NYPD. The FBI searches the church grounds, but Maggie’s continued misdirection keeps the agency from finding Matt and Karen. Whenever Ray tries to call of the search, Dex reminds him that if they come back to Fisk empty-handed, then there will be repercussions. Theo presses Foggy to walk back his criticism of Fisk in order to protect the family. Theo says that Fisk put them in this situation because Fisk wanted to compromise Foggy. If Foggy hadn’t been trying to make a name for himself as some big-shot lawyer, then none of this would have happened. Foggy tells Theo that Theo knew what he was doing was fraud. Matt calls Foggy, who heads down to the church and talks with Brett. The two work out a deal where Karen surrenders herself to the NYPD, who has jurisdiction, not the FBI. Brett gets Karen and Foggy away, then releases the two. Karen and Foggy meet Matt on a rooftop, where Matt says the only way to bring down Fisk is by killing him. 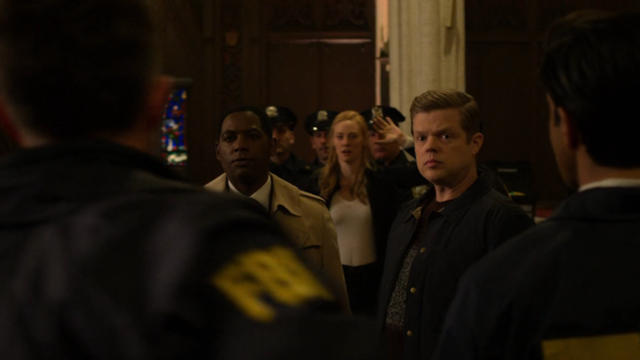 Foggy convinces Matt that the way to bring down Fisk is within the confines of the law, not outside of it. But, it’ll only happen if the three of them work together and can provide another witness against Fisk. Ray’s conscience and Maggie’s words cause Ray to help Brett get Karen away. Returning home, Ray tells his family to pack their bags and go. Before they can leave the house, it is surrounded by Fisk’s men. 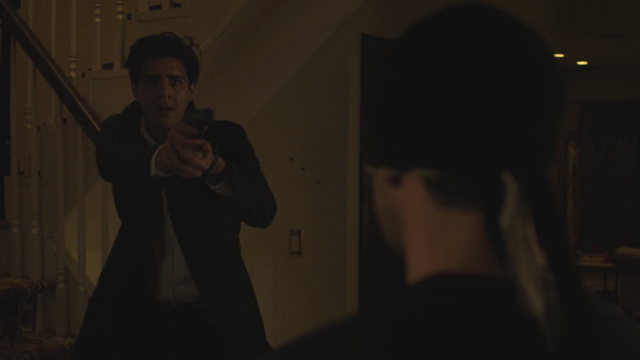 Matt arrives and tells Ray to get his family and come on, but Ray doesn’t trust Matt after he sided with Fisk against Matt. Matt says that he trusts Ray after he saved Karen, and removes his mask to prove to Ray in order to demonstrate that trust. 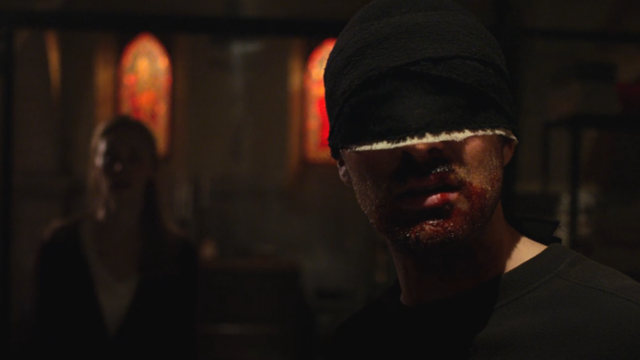 What did you think about Daredevil season 3 episode 11? Let us know in the comments below!